After having a reasonable little session on small Barra with Jake yesterday I decided to take the family back there today. 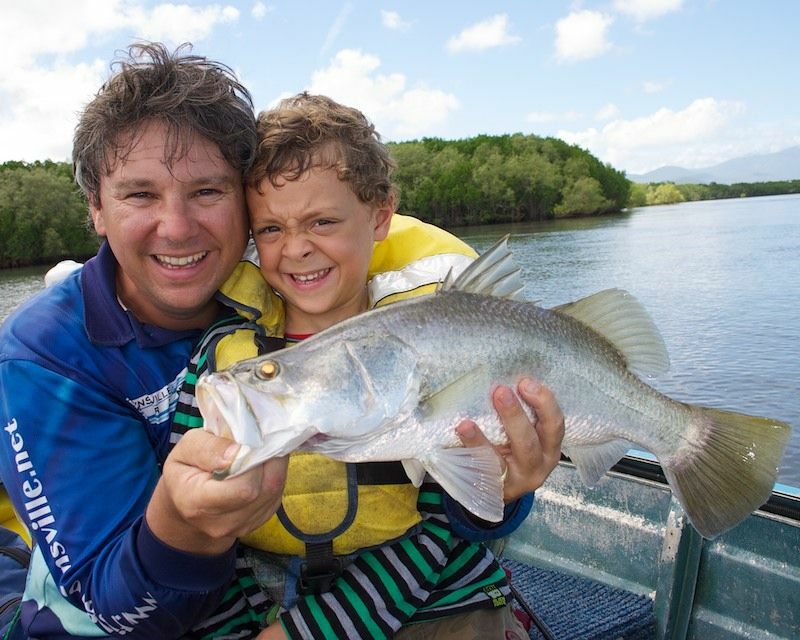 The kids and Tania haven't don't much in the way of lure fishing, especially for Barramundi. So I figured if the fish were in same mood as yesterday they were in with a pretty good chance. With the top of tide a bit later today, we didn't even have to get up early! That suited the rest of the family quite well, and we didn't drive out of home until about 8.30am. On arrival the tide had just started to pick up some pace. The water was nice and clean and I was excited to get casting. But a few bends downstream we came past a broken down tinnie. The guys were paddling like mad against the current, and I don't think it would have been long and the would have been going backward! So we towed them back to the ramp. We lost 20mins or so, but were soon heading off to our spot again. Water was just starting to race out of the little creek mouth, and the dirty water line was forming nicely. The bait was stacked up and odd Barra was starting to cut up the surface. I missed a good fish on an early cast, it hit hard and shook out the lure as it thrashed on the surface. It was a while then before we saw another fish. We worked the bait around the front of the mangroves and has several follows from small GT's. 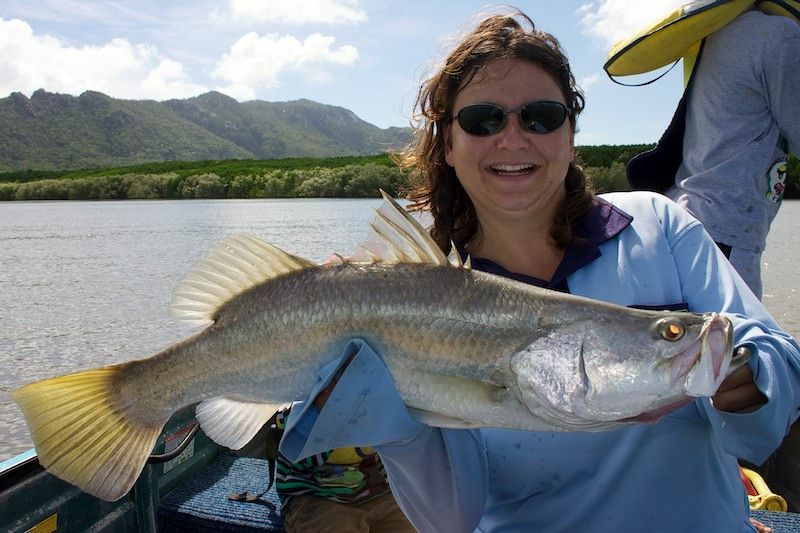 But the Barramundi appeared to be well back in high water still. But as the water dropped the fish fired up again. Tania was next to get a strike, it took her totally by surprise as she paused the lure to take a bite form an apple! The fish fought well in the fast running water, but it never got airborne. A few tense moments and the fish was led into the net. At 60cm in length it was just a keeper! 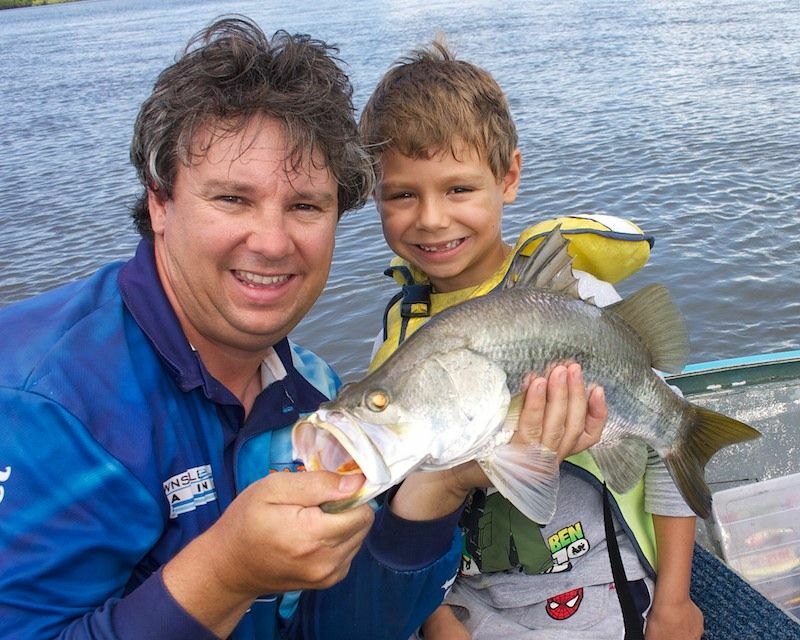 Lachlan was using a lighter spin rod with a 3in prong. He was casting like a champ and I had my fingers crossed he would hook up! But I was next to get a strike. And within seconds Lachy was on too! A double hookup and all hell broke loose. The two fish were back and forward around each other while Tania went of the net. 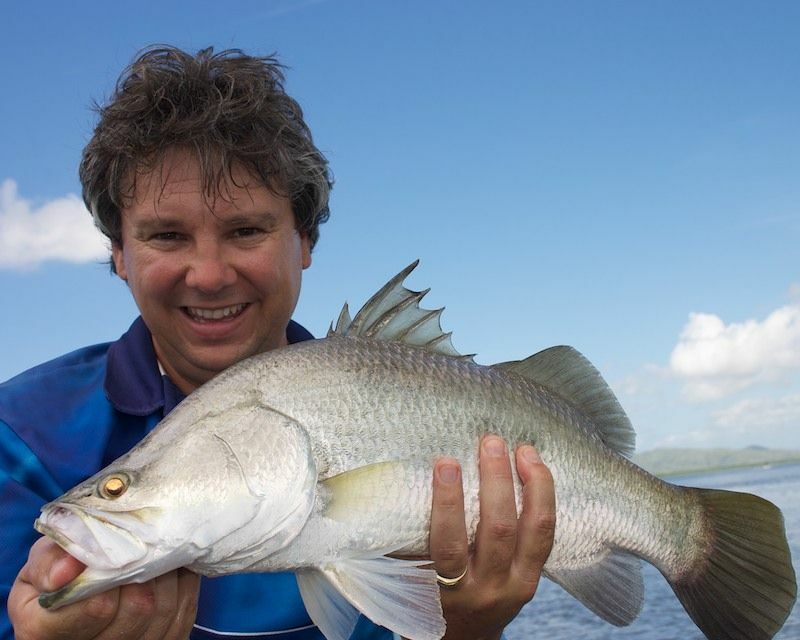 Somehow in all the chaos and lack of assistance Lachy managed to guide his fish around the electric motor an to the boat. My fish was now in the net all tangled in about 50m of someones lost braid! Seeing that Lachys fish was under size I did a quick lift over the side. Everything held and we were soon photographing the pair of 55cm fish. 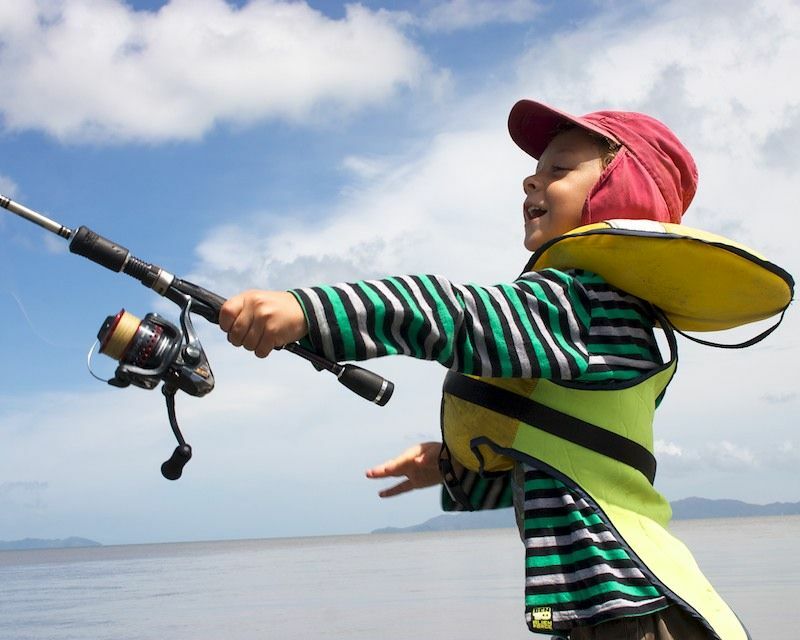 Lachlan was happy now and handed the rod to Sebastian for a go. Sebastian was keen as mustard, and it took only 1 cast for him to hook up! He handled the fish like a pro and soon had it in the net. Another fish about 55cm. In total we landed 6 Barra and jumped off several more. Everyone caught at lest 1 fish and a really good time. We were back at the ramp pulling out by 11am. Not a bad couple of hours on the water!